Could the market have closed the week out any further from where we started? The S&P quietly and enthusiastically attempted a new all-time high coming off a holiday Monday. Not only did the highs not stick, but the market reversed hard searching for buyers. $IBM (bellwether well off its 2013 highs) got clipped after hours on Tuesday and the stayed on the mat Wednesday. The tone we felt on Tuesday was that retail was reluctant to sell for fear of missing out on the next spike (FOMO). Put another way, the crowd needed a new high more than the market did. Thursday gapped down and never looked back. PMI out of China spooked the market something fierce. Friday closed out with high energy new low prints right into the closing bell. All of this is nice to note after the fact and would mean nothing unless we could identify it in real time. You can feel the tension and anxiety in the tape. Sell orders = instant remorse. Everyone wants MOAR. Compare the breadth of the S&P 500 (large caps), S&P 600 (small caps), and the overall NYSE. The market feels like indiscriminate selling, but there is actually a reach for liquidity in large cap stocks. This means that traders are leaning hard on liquid stocks rather than letting go of their favorites. If this is truly a serious correction, we might not be as close to a bottoming process as some might think. Let the market loosen up a bit more before catching knives. 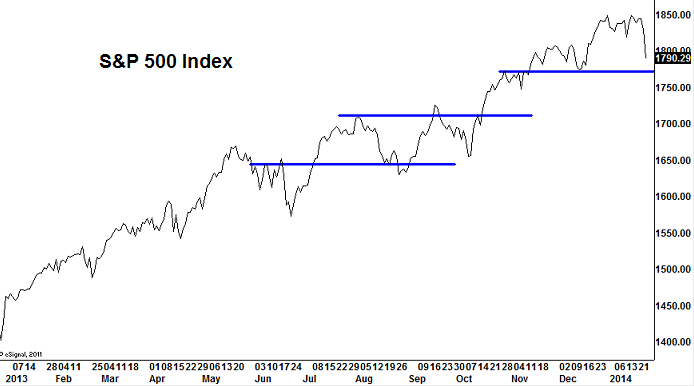 Everyone is looking at 1770 as the line in the sand as far as the uptrend is concerned. In an algo driven market, all liquidity points are virtually guaranteed to be hit, so 1770 more magnet than line in the sand. The goal is to test a significant level and free up liquidity to trade around. After all the stops have been triggered the idea they’ll figure out if there are still more sellers than buyers. If so, expect the next area to be tested (1710). If buyers push back hard, then we have a false breakdown. One or the other (or some combination) will occur, but we won’t know much until we get there and watch it play out. 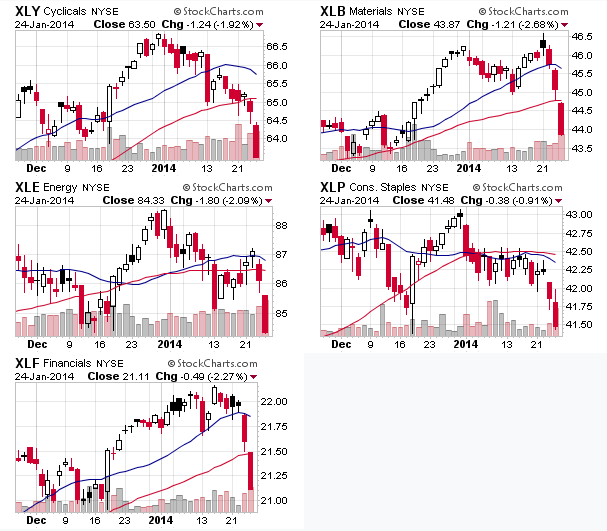 Five of the nine most important sectors (no one cares about telecom) are at or breaching their December lows. It would be an anomaly if the $SPX were not to test the level. For most unlevered investors, these wiggles in the market shouldn’t mean much. Bull markets do not terminate with consumer sentiment readings in the 70s and 80s – so we still feel that we’re in a long-term bull market. 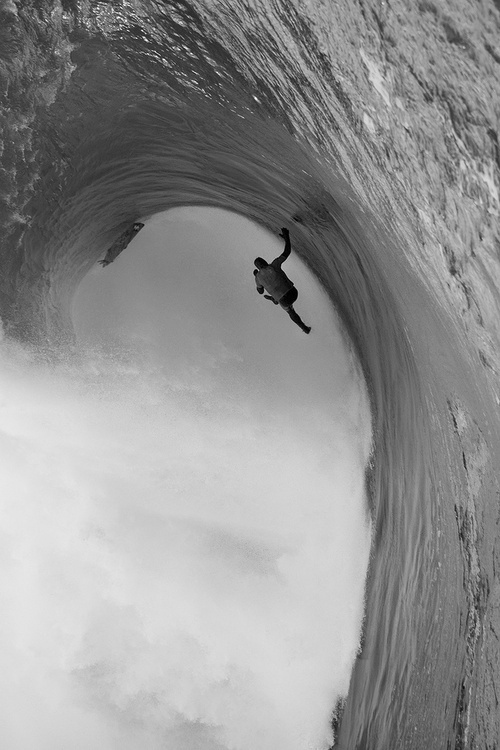 Pullbacks remove the brittle participants from the risk pool and reestablish where the long-term value is perceived to be – but they’re not much fun. If you need to hide out, I think tech and healthcare seem like the safest places for now.